The Adventure Caffè was more crowded than usual but Lapinette had a plan. "We have two Commanders and that's one too many." The Wabbit grinned. "What's your recommendation?" Lapinette pointed at the Wabsworths. "Command should temporarily rest with our androids." Wabsworth and his opposite knew this was coming. Their paws touched. Electricity flashed as data exchanged. They both smiled at the same time. "We agree," said the Wabsworths. "Oh I'm so glad that's settled," said the Wabbit. "So now we can ask the question," said the Wabsworths together. The atmosphere relaxed. "Skratch," asked Lapinette, "what was that for a sort of adventure?" "It's not finished yet," said Skratch. He glared at his opposite. "You must surely know that it was a sequential nested narrative." "Certainly not," replied his opposite. "That's narratological flim flam." Lapinette leaned forward. "Our representation of time and space is an enunciation that mediates between codec textuality and visual concretions." Both Skratches fell silent. 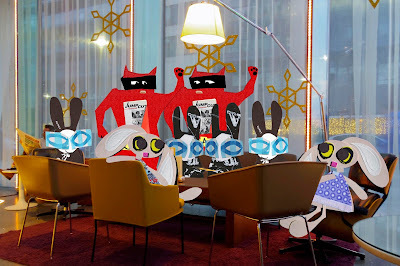 The Wabbit winked at his opposite and his opposite winked back. Then they all laughed. "Listen up," said the Wabsworths. "We have reports of a manifestation of the Fifth Force in Rome." "I'll round up my personal guard," said Lapinette. The other Lapinette rolled her eyes. "My personal guard, you mean."